John Bolton also suggested that the “false flag” might have come from the Obama administration. The Washington Post and The New York Times reported Friday that an assessment by the CIA concluded that Russia interfered in the election to help President-elect Donald Trump. 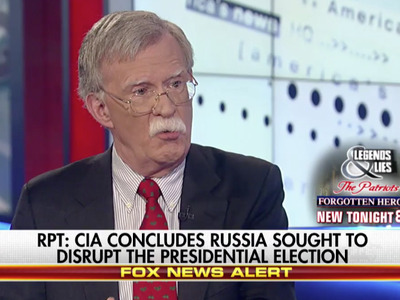 “It’s not at all clear to me just viewing this from the outside that this hacking into the DNC and the RNC computers was not a false flag operation,” Bolton said on Fox News. He then turned to the FBI investigation into Democratic presidential nominee Hillary Clinton’s private email server. “[FBI Director James Comey] said we found no direct evidence of foreign intelligence service penetration,” Bolton said. Other Republican lawmakers, including Sen. John McCain and Majority Leader Mitch McConnell, have joined calls for more thorough investigation into Russian interference in the election. Bolton did say that “if the facts prove out that Russia did try to influence our election, they should face very grave consequences.” He also said he believes that Russian actors “have the capability and intention” to hack the US. But he didn’t seem willing to accept US government reports pointing to Russia as a culprit in hacks that targeted US institutions such as the Democratic National Committee. “I don’t think we have anywhere enough in the public domain to know what the facts are,” he said.